You have already learned about ArrayList in the previous section. An ArrayList resizes automatically as it grows. The List<T> collection is the same as an ArrayList except that List<T> is a generic collection whereas ArrayList is a non-generic collection. The following diagram illustrates the List<T> hierarchy. As shown in the above diagram, the List<T> class implements eight different interfaces that provide different functionalities. Hence, the List<T> object can be assigned to any of its interface type variables. However, it is recommended to create an object of List<T> and assign it to IList<T> or List<T> type variable, as shown below. In the above example, the first statement uses List<T> type variable, whereas the second statement uses IList<T> type variable. The List<T> is a concreate implementation of IList<T> interface. In the object-oriented programming, it is advisable to program to interface rather than concreate class. So use IList<T> type variable to create an object of List<T>. Add Adds an element at the end of a List<T>. AddRange Adds elements of the specified collection at the end of a List<T>. BinarySearch Search the element and returns an index of the element. Clear Removes all the elements from a List<T>. Contains Checks whether the speciied element exists or not in a List<T>. Find Finds the first element based on the specified predicate function. Foreach Iterates through a List<T>. Insert Inserts an element at the specified index in a List<T>. InsertRange Inserts elements of another collection at the specified index. Remove Removes the first occurence of the specified element. RemoveAt Removes the element at the specified index. RemoveRange Removes all the elements that match with the supplied predicate function. Sort Sorts all the elements. TrimExcess Sets the capacity to the actual number of elements. TrueForAll Determines whether every element in theÂ List<T> matches the conditions defined by the specified predicate. Use the IList.Add() method to add an element into a List collection. The following example adds int value into a List<T> of int type. Use List.AddRange() method adds all the elements from another collection. Note : The AddRange() method will only be applicable if you initialized with a List<T> variable. IList<T> doesn't include the AddRange() method. Use a foreach or for loop to iterate a List<T> collection. Use the Count property to get the total number of elements in the List. 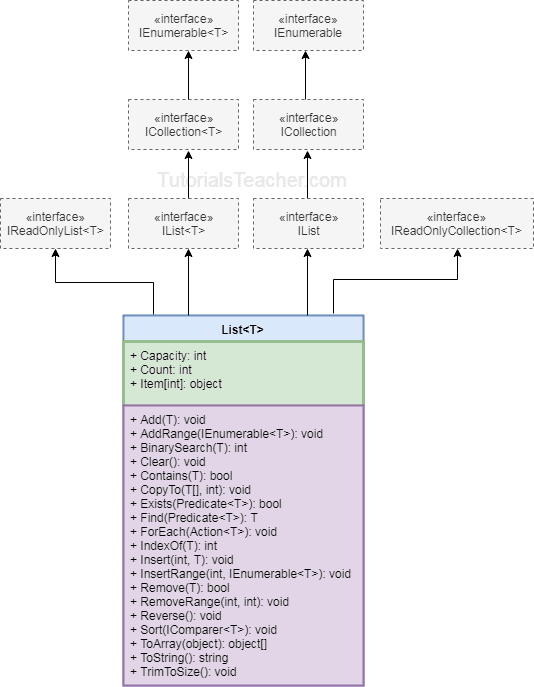 List<T> implements IList<T>, so List<T> implicitly type cast to IList<T>. Use the IList.Insert() method inserts an element into a List<T> collection at the specified index. intList.Insert(1, 11);// inserts 11 at 1st index: after 10. The Remove() and RemoveAt() methods to remove items from a List<T> collection. The TrueForAll() is a method of the List<T> class that returns true if the specified condition turns out to be true, otherwise false. Here, the condition can be specified as the predicate type deligate or the lambda expression. The following example uses isPositiveInt() as a Predicate<int> type delegate as a parameter to TrueForAll. Visit MSDN to for more information on the methods & properties of IList<T> or List<T>. List<T> stores elements of the specified type and it grows automatically. List<T> can store multiple null and duplicate elements. List<T> can be access using indexer, for loop or foreach statement. LINQ can be use to query List<T> collection. List<T> is ideal for storing and retrieving large number of elements.